With true to form German purpose and application, Dievas Uhren have recently released their version of a dive watch. Not just any dive watch of course, but one that has taken on board the input, comments and requests of professional divers, sports and military professionals, and last but by no means least, watch aficionados. Dievas Uhren believes the new Focal will stand comparison with some of the best divers on the market. Here’s why. Made in Germany – That still stands for a lot, top quality, technologically sound, beautifully engineered and built to a high standard. 6 times hardened steel - Dievas have gone to great trouble to ensure that the 316L stainless steel is considerably tougher than old boots. They put the steel through an exhaustive process to harden it to six times its normal strength, leaving each watch in a hardening chamber for two weeks. Then they test the watch again to ensure its resilience. With 1300 Hv this puts the watch in the same league as Sinn’s steel dive watches. Corrosion resistant - During the same process multiple layers of plasma are applied to the entire surface area including the case back to protect the steel from the corrosion of sea water, sweat and other nasties. 500m diving depth – The watch is water resistant to 500 metres, not as much as some, including the excellent CX Swiss Military range which are water resistant to over 3,500 metres, but enough for most divers. 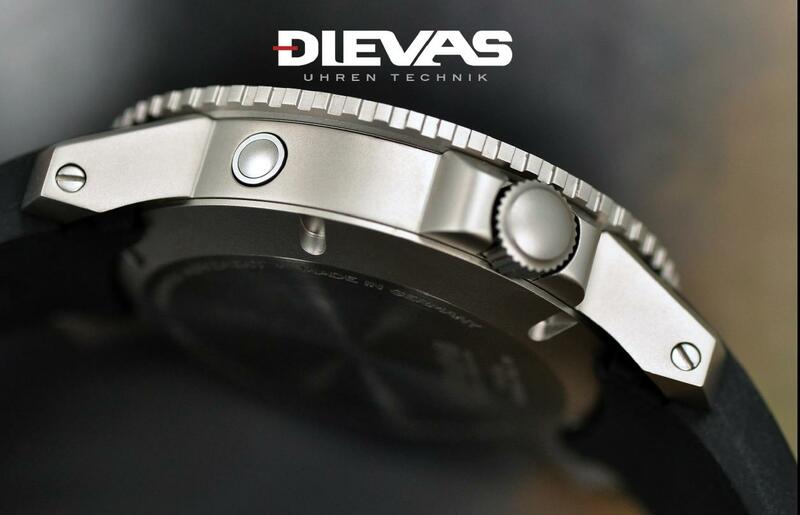 Dievas also claim to test the watches to way beyond their WR to ensure no leaks. Automatic movement – The watch is powered by the ETA 2824-2 movement modified with a Dieves CNC customised rotor. Each watch is adjusted to five positions for greater accuracy. The 45 mm x 14.5 mm case is hand finished to give it extra sheen. The crown is at 8 o’ clock, and, like the enlarged gear edged unidirectional bezel, is designed to be adjusted while wearing diving gloves. 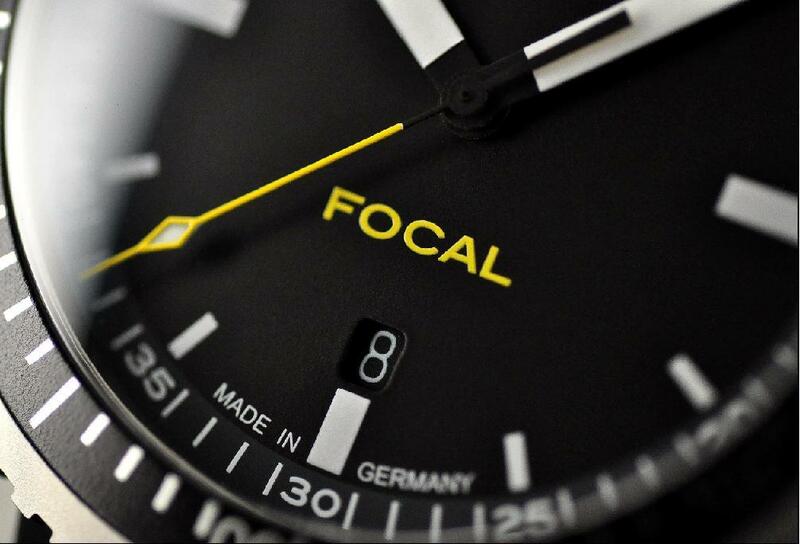 The hands and dials are minimalist with a modern military styling. The oversized hands are coated with top grade Swiss luminova for ease of legibility underwater. As for the dial, there’s a bright splash of colour on an otherwise densely black platform afforded by the bright yellow FOCAL brand name positioned above the date aperture at 6 o’ clock, and the matching yellow secondhand. 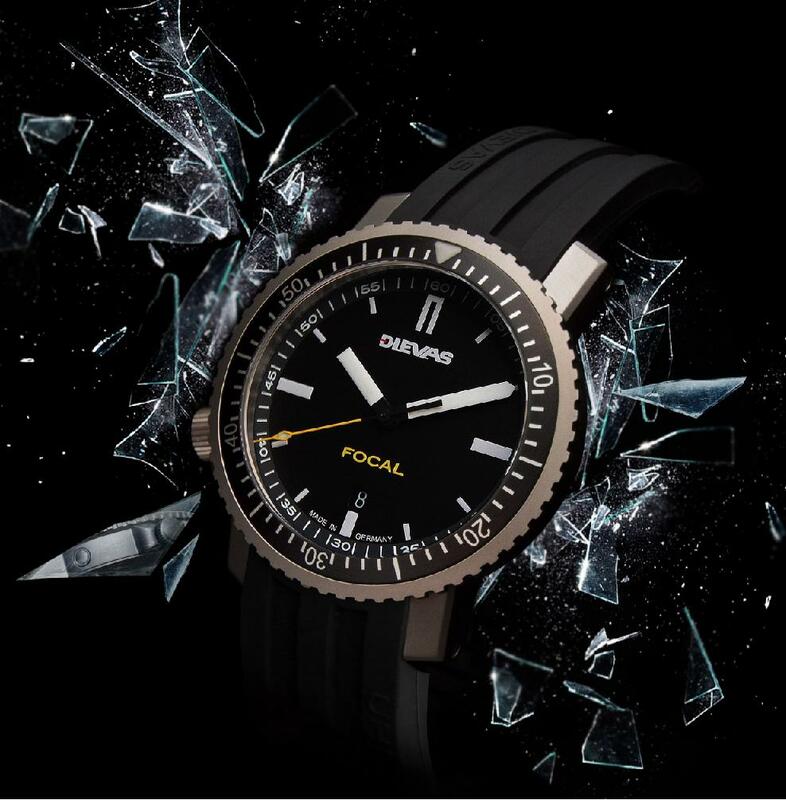 The Focal is fitted with an anti-reflective sapphire crystal and comes on an Italian rubber strap that features a dive style clasp with a wet suit extension. The Focal also comes with a carrycase with an extra waterproof leather strap and changing tool. 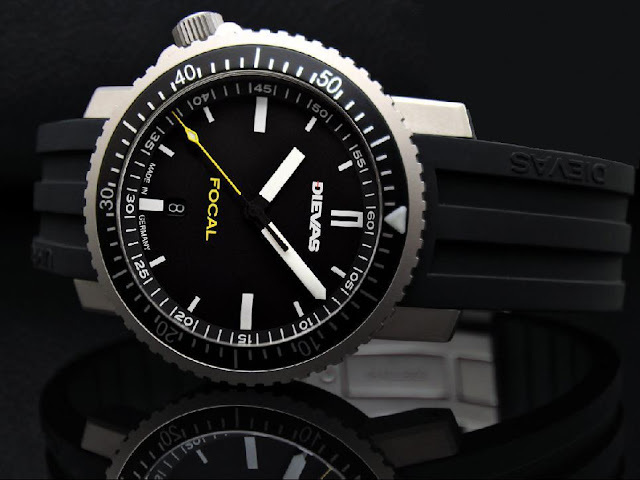 The Dievas Focal dive watch retails at a competitive $1280 and can be ordered directly online via the Dievas website and via Watchuseek. No one could accuse the Dievas Focal of being a flashy fashion statement, but as a solid, functional and reliable dive watch, it’s a real contender.